The stuffed parathas are the thing of North Indians. We south Indians, though enjoy it in the restaurants and all, don’t make it that very often at home. Somehow it is not on our regular day today menu. But if you ask me, its a very quick easy weekday dinner to make. You don’t have to make an elaborate curry for the roti, but still all the necessary veggies n protein goes in the paratha. This hot fresh aloo paratha can be enjoyed with a dollop of curd/yogurt and your favorite pickle. 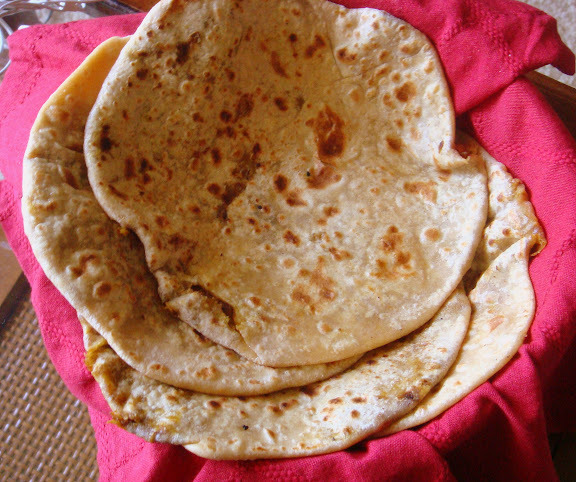 Aloo paratha is one of the easiest parathas to make for two reasons. One, you will always have a couple of potatoes in your pantry. Second, its loved by both kids and adults alike. Saves you from the hassle of making roti and sabzi. A quick easy weeknight dinner. Mix wheat flour, salt and water to make a soft dough. Knead it well on a lighty greased surface or on the kitchen counter top for a few minutes, until the dough become soft and pliable. Cover with a damp cloth and set aside for about 10 min. Boil potatoes in water, until it becomes tender. Once cooled enoguh to handle, peel the potatoes and mash them well. Add chopped cilantro, diced green chili, cumin seeds, salt, garam masala and amchur powder. Divide the dough into six equal parts and roll them into smooth balls. Divide the potato filling also into 6 parts and shape them into balls. Roll the dough into 3 inch circles and place the filling ball in the middle. Pull the edges of the dough from all sides to wrap and cover the filling. Let the wrapped balls sit for a couple of minutes. Heat a heavy bottom skillet on medium-high to cook the parathas. Take each wrapped ball and press it in wheat flour on both sides. Roll them out into six inch circles, keeping the sealed side up. Dust the dough with wheat flour as and when needed while rolling, to prevent the dough from sticking to the rolling pin or the surface. Put the paratha on the hot skillet, when it starts puffing up, flip it over and drizzle some oil or ghee and press it gently with the spatula. Repeat with the other side too. Cook the paratha, till it gets golden brown on both sides. If not using right away, cool them on a wire rack for a few minutes(to prevent it from getting soggy and soft) and them wrap them in foil and save it in the refrigerator/ freezer for later.